Designs for town halls in the 19th century generally included large public halls where citizens of towns and cities could gather for a wide variety of events. 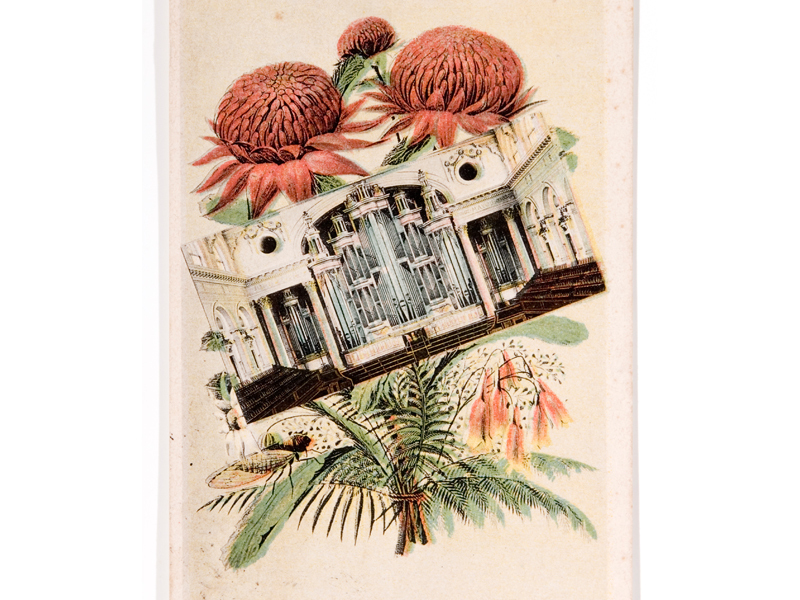 Many were equipped with imposing organs which had the capacity to fill large spaces with sound and the flexibility to adapt to suit all tastes and musical genres. Sydney’s aldermen were determined to ensure Sydney had not only the best, but the grandest money could buy. 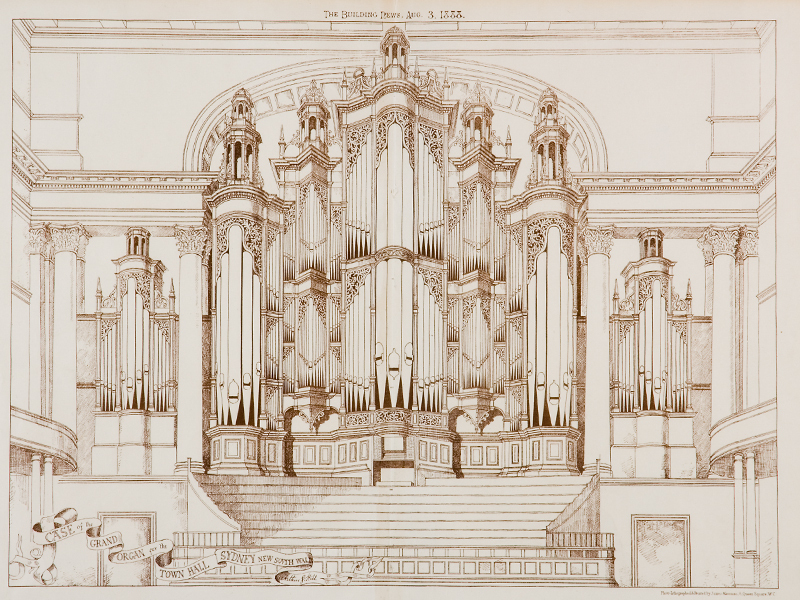 In 1879, long before the ink had dried on final plans for Centennial Hall, discussions had been underway about the organ which would be its centrepiece. The first specification, an instrument of 59 speaking stops at a cost of £5,000, was thought to have been too modest for the size of the hall so an Organ Committee of local organists and organ builders was established to prepare a specification for a suitable instrument. Its recommendations suggested an organ with five manuals and pedals and almost 150 stops and couplers which exceeded anything built to date, and the names of two English firms capable of undertaking the commission. Messrs William Hill and Sons successfully won the open tender to build the organ, ship it out to Australia, erect it in situ in Centennial Hall and maintain it for 12 months. Although not the lowest quote, William Hill and Son offered the inclusion of a full-length 64 foot pedal stop -which was a world-first at the time and certain to make Sydney’s organ the envy of the world. Work on the construction of the organ commenced in London in 1886 and was completed in June 1889. Before it was dismantled and shipped to Sydney, William Hill and Son invited prominent English organists, including Westminster Abbey’s Dr Bridge and Liverpool City Organist, Mr W T Best, to play it and assess its performance. Both agreed on its superiority, declaring it respectively ‘the finest organ ever built by an English organ builder’ and ’a marvel of excellence in both tone and mechanism’ – which must have delighted Sydney’s aldermen who were eagerly awaiting its installation as the final flourish in their quest to create a town hall which would outshine all others. Leading English organ builders, William Hill and Son, designed and built the organ in London, then dismantled it for its journey by sea to Australia. Dr Arthur Hill, a leading authority on historic organs at the time, designed the decorative casing for the organ, basing it on a mid-17th century Baroque style organ case in the Church of St James, Stralsund (Northern Germany). Although his design offended the City’s architect, who considered his own design was more in keeping with the modern character of Centennial Hall, Hill’s design was selected with the support of the Organ Committee. To transfer the organ to Sydney, the entire instrument was dismantled and packed into 94 crates, stowed aboard the Gulf of Venice, arriving in Sydney just days before the opening of Centennial Hall in November 1889. It took seven months to erect it, during which time local organ builders were called in to assist Hill’s staff. The organ components, including nearly 9,000 pipes, were installed in a large alcove at the back of the stage with the gas combustion engine for pumping the bellows placed in a lean-to immediately behind the building. In 1906 the gas engine and bellows were replaced by electrically powered fan compressors. To launch the Grand Organ, a festival of musical celebration was planned and Council invited Liverpool’s City Organist, W T Best, to perform the opening recital on 9 August 1890, which was attended by 4,000 invited guests. Best remained in Sydney, presenting eleven concert programs in 23 days, performing a classical repertoire and some of his own compositions. The following year, the first City Organist, Belgian-born Auguste Wiegand was appointed and there began the tradition for public organ recitals offered by Council-appointed city organists which continues to this day. The opening of the Grand Organ on 9 August 1890 was attended by over 4,000 invited guests.